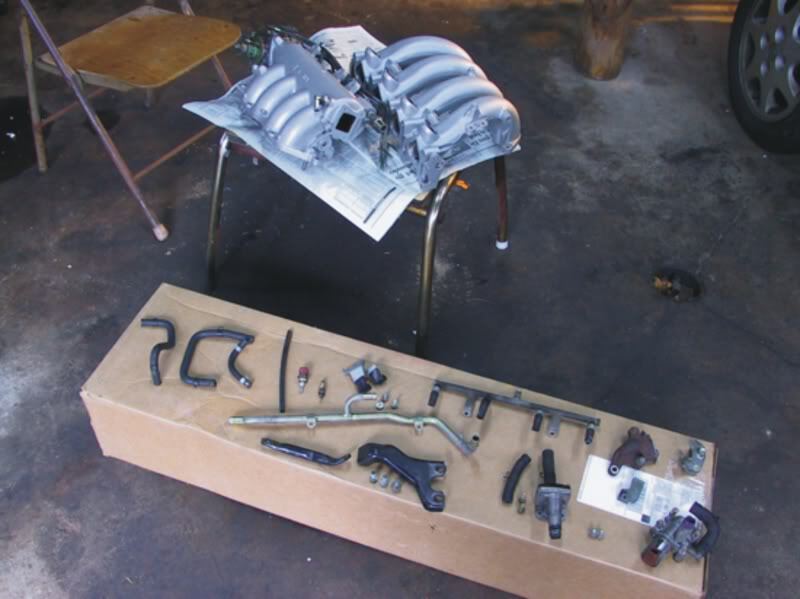 The following DIY will outline the parts you can remove (and the parts you can keep) on the S13 intake manifold when doing a KA-T build. 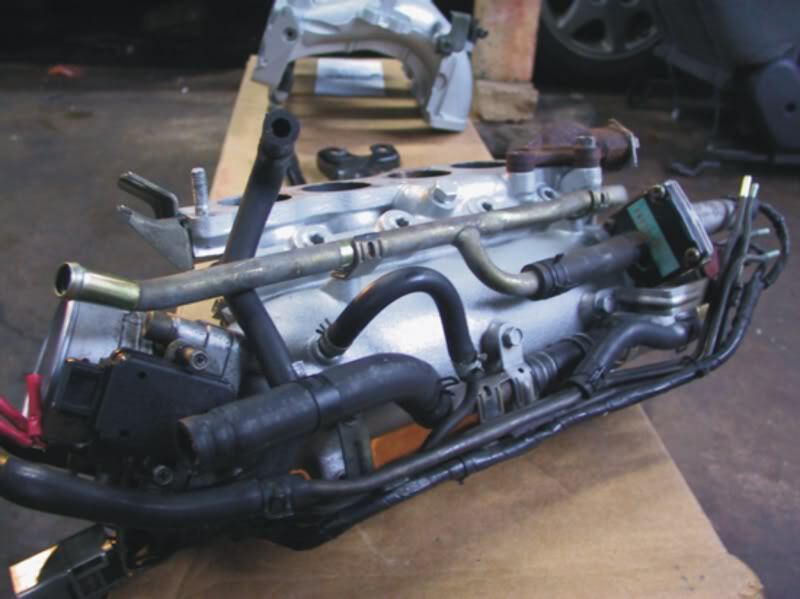 The intake manifold can be separated into an upper portion and a lower portion.Most of the emissions control/idle/coolant stuff is located on the lower portion, with the exception of the PCV system which gets vacuum from the upper portion.I will explain further. 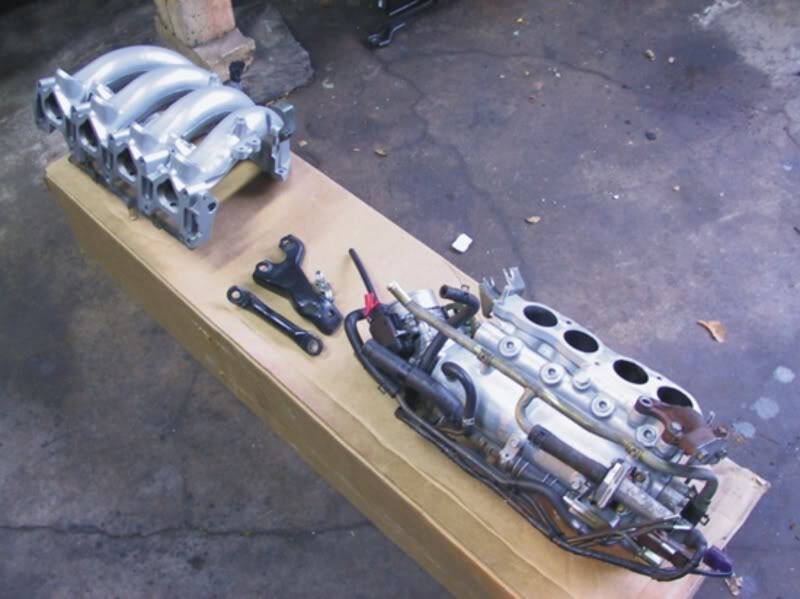 Upper portion is on the left, lower portion is on the right.In between is the mounting hardware for the manifold.Note also that there is a gasket that fits in between these two parts (Advance Auto has both intake mani gaskets – this one and the one between the mani and the head – for 6 bucks). Most of the parts that you NEED to keep when pulling emissions stuff off of the mani are right here on this cardboard box. Note also that there are a couple other small things that I left on the lower portion while painting that you will need as well.You will see these parts in later pics and also it will be obvious what is necessary, as everything fits together in unison so you can’t just exclude something and forget about it without obvious dangling parts. I don’t have a list of everything that you can throw away, but I do have pics and info on the things you need to keep.Everything else, you can assume, may be removed and disposed of/sold. Okay starting from the top right, the rusty brown part is the beginning of the EGR.Note that I have blocked the exit hole there with that plate I made (shaped sort of like a house with a roof).You need to make sure you get a good seal here. 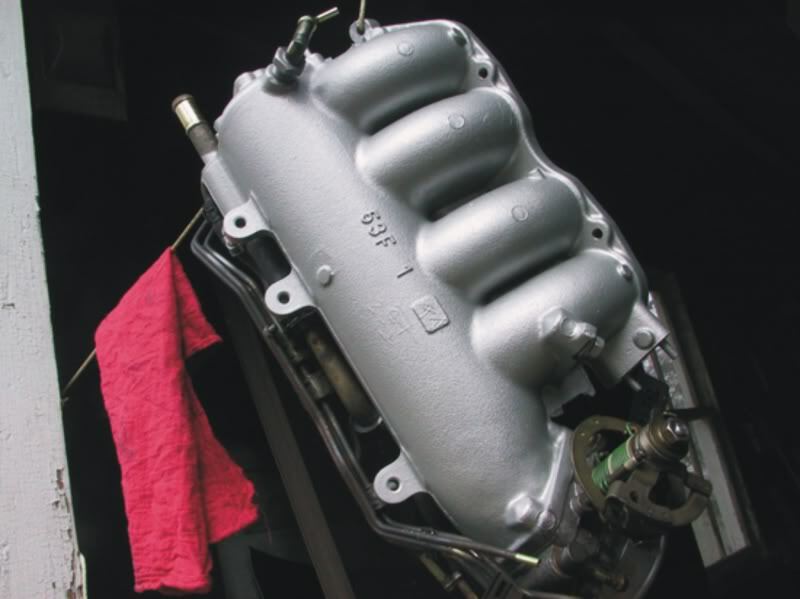 Directly below my EGR block off plate is a big thick metal pipe.This runs in between the AAC (Auxilary Air Control Device – commonly referred to as the IACV- Idle Air Control Valve.This valve, with the purple plug on it, lets air into your intake manifold to regulate idle speed) and the front of the engine, where it needs to see a vacuum before the throttle plate (more on this later). You can’t see it in this pic, but that large pipe also has a small branch off of that goes into another necessary valve which is associated with the IACV/AAC (this is the part with the red spot on it). 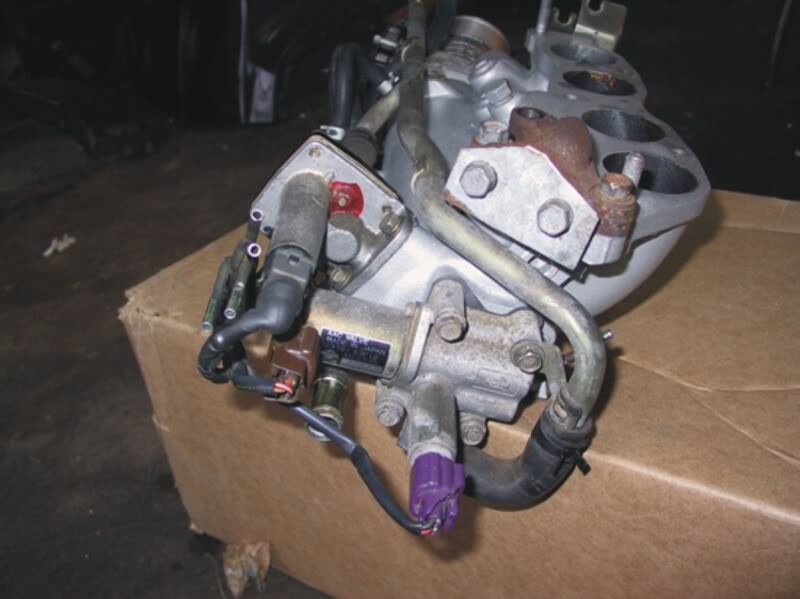 Note that both the AAC/IACV and the other valve have electrical connections (total of 3) that need to remain.These go towards the throttle body and attach to a plug up there. See to the left of the part with the red spot on it, there are some small metal hoses.These were used for various emissions related vacuum lines.You will not need these specifically, but they are a pain to remove and you can use them yourself to transport vacuum if you would like later on for things like your BOV or whatever. 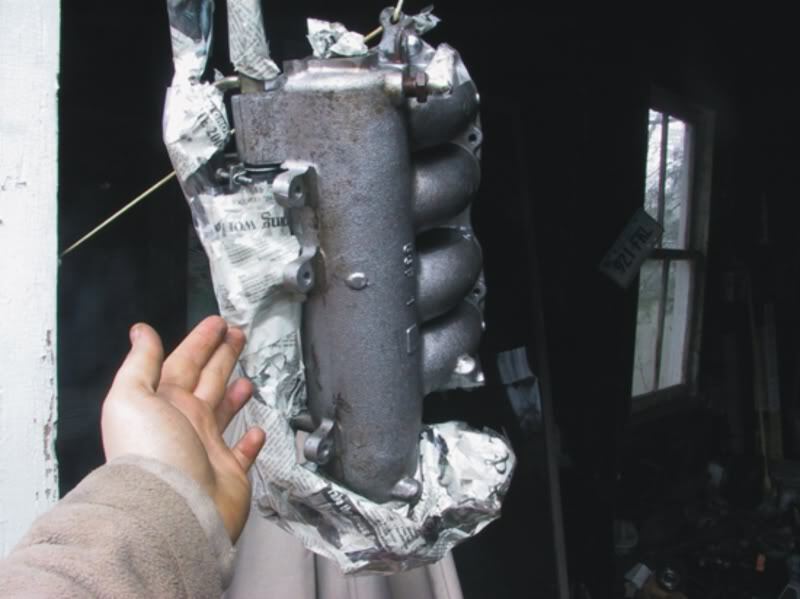 This is the “underside” of the lower intake manifold.The rear of the mani is to the right, the front including the throttle body is to the left.Towards the top you can see that long metal pipe for the IACV/AAC that I mentioned above.Also you can see the branch off into the other valve (with the green sticker, this is the one that had the red spot on it in the pic before).Below the pipe you can see one vacuum hose that comes out of the intake manifold, makes a curve (upside down U) and goes into a metal pipe (next to the fat rubber hose).This is a vacuum that goes up towards the front, that USED to be used for the charcoal canister.Remember to follow this line and mark which one it is up front, because this vacuum will need to be plugged (or used for your BOV if you want to be crafty).If you don’t plug or use this line, your idle will be very high and it will take you forever to find out why. Also note the big fat rubber hose next to that vacuum.This is a coolant line that runs from front to back on the manifold.It is the return line from the heater core. Below that large rubber hose is a series of small metal pipes.These can be removed like I said, but they are a pain and you might want to use them for yourself. Below those pipes you can see the long black (shiny) wire that runs from the valves in back to the plug up front.I zip-tied these to the small metal tubes to keep everything neat. On to the front of the intake manifold… Starting from the right on the upper intake manifold, you can see two sensors – one red, one blackish.These are coolant sensors that you obviously have to keep.When you’re doing all this messing with your intake manifold, I recommend taking these out and re-teflon taping them up for for a good seal. To the left of those sensors you can see the small metal tube sticking out that are referenced in the other two parts above.This is the tube coming from the IACV/AAC.To this you need to attach a hose that will go to a plug in your intercooler piping after your IC and before the throttle body. Below the throttle body you can see the plug from the wires that came from the valves in the rear of the manifold.This meets up with a plug that I will show you next. 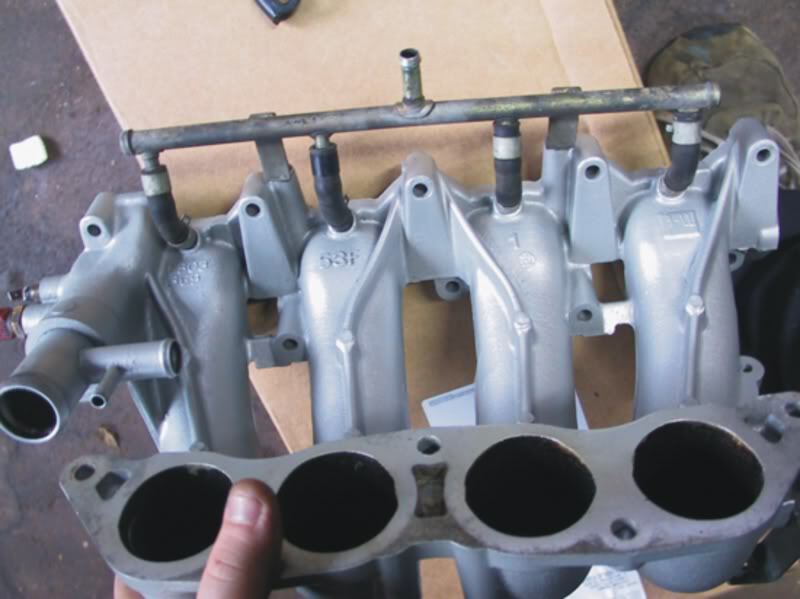 There is nothing you can really remove from the front of the manifold here except the vacuum hoses that come off of the small metal tubes that I mentioned earlier (the ones I said were a pain to remove. )Just plug them all up (one of these is the charcoal vacuum I mentioned earlier, which has to be plugged of course). There are some funky coolant lines around this area that you need to pay attention to but nothing you can modify.All of it stays stock. 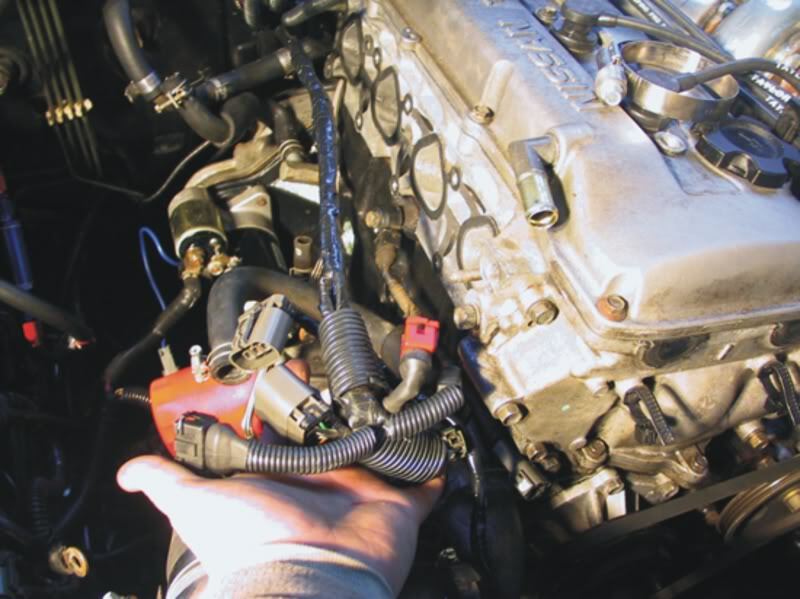 In this pic I am holding all of the plugs that connect to stuff on the front of the intake manifold.I separated all of these wires from the bunch that, stock, runs across the top of the upper intake manifold below the fuel rail. Note that this bunch of wires does NOT include the injector wires.. I did those separate for the sake of neatness. You can see in my hand all the plugs that are on the front of the mani… also in this bunch (although you cant see it) is the plug that goes on the distributor.You can see the clips for it on the front of the upper timing cover there. I just recommend doing it this way for neatness sake. 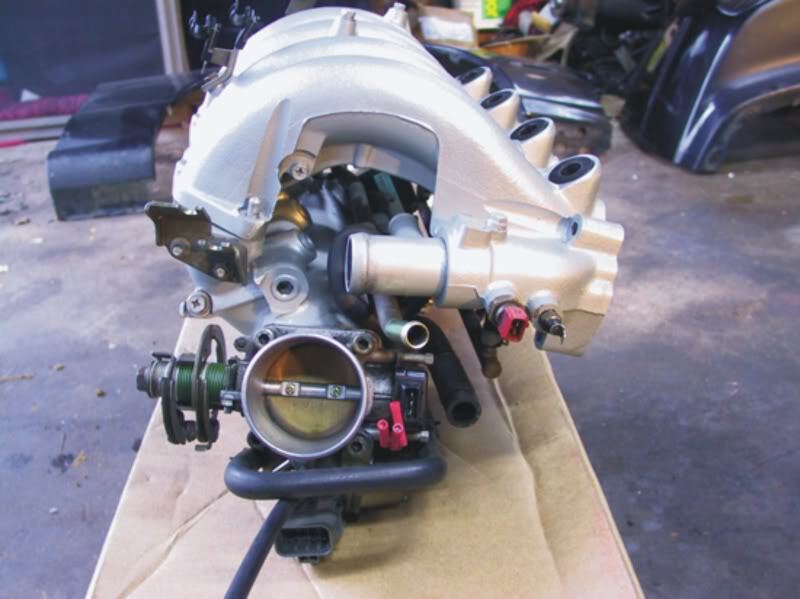 The port on the pipe there connects to a vacuum hose that connects to a funny looking box which bolts on to the side of the block near the throttle body.Keep all the vacuum lines and hardware associated with this system. Note that I did not include any information on the fuel lines.This is because I used a custom top feed rail and line setup on my engine, so I don’t really have too many pics and info about it.Basically the fuel feed is on the front of the rail (comes from the filter), and the return and fuel pressure regulator is on the rear of the rail (which goes to the return line, of course).You don’t have to keep the stock system the way it is, but you obviously cant remove it completely either.Picking what you want to do with this is a matter of preference. Well thats just about it!I’m sure I missed a thing or two and I may be incorrect once or more than once haha… So any questions feel free to ask, and any corrections feel free to post. 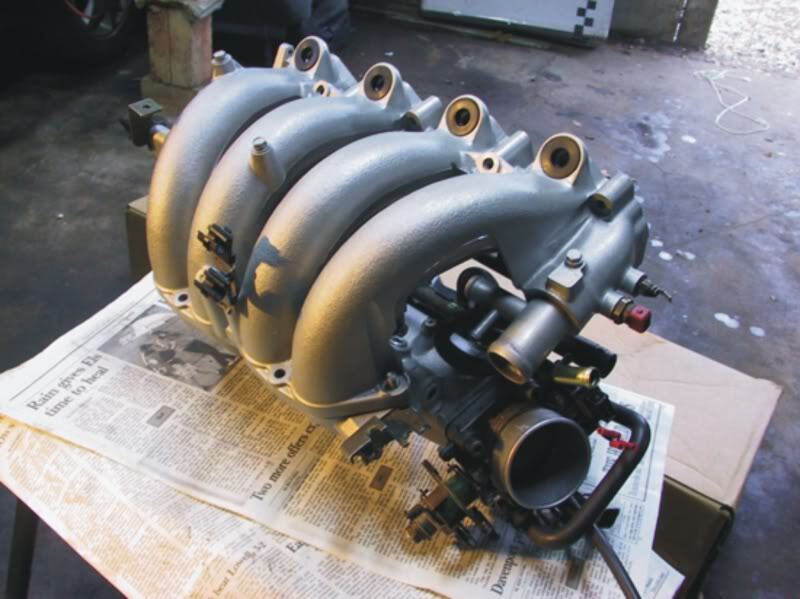 With just some engine degreaser, wire brush, a couple coats, and some dry time.Very easy and it looks pretty nice.